WatchMeRecord allows you to quickly making audio recordings either using your watch or your phone to start the recording. Recordings can be triggered independently or simultaneously on both devices allowing you to record two events at the same time. You can discreetly use an Apple Watch as a remote control to start a recording on your iPhone, or equally use your iPhone to start your Apple Watch recording. You can even start them both recording at the same time for two recordings from two separate perspectives. For instance, your phone could be recording the vocals of your recording session, and your watch could be recording the instrument(s). – Recording and playback capability from Apple Watch and iPhone. – Playback recordings stored only on your iPhone through the watch. – Ability to start recordings using your iPhone microphone from your Apple Watch, even when the app is closed and your iPhone is locked. 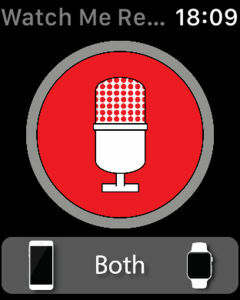 Simply toggle the switch to choose to record on the watch, phone or both. Playing back a file with speech in it automatically displays the transcript of that speech. Force Touch (hard press watch screen) in Playback mode to get the different functionality like delete and rename. MADCAT is an innovative content search, duplication and time synchronisation system for audio and video files. It is based on the principle that if two or more different recordings contain the same acoustic events, it is possible to search for and identify the parts of the audio that are overlapping and to provide a precise time of match.